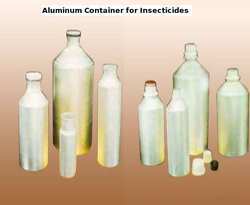 Providing you the best range of aluminum containers for insecticides with effective & timely delivery. Aluminum Containers for Insecticides offered come with longer shelf life as well as leak proof hygienic (with food grade lacquering) finish. Offering safe & pilfer proof usage, these containers are also puncture resistant, recyclable and come with excellent barrier properties. We can offer these containers with optional protective lining on inside and in attractive finishes with different colored lids to match client labels. With finish options including matt, brushed, these aluminum containers are one of most widely used packaging mediums for fertilizer industry and can be made available in sizes from 15 ml to 5 Ltrs and various design options. Further, all bottles bear tested leak proof closures so as to ensure complete handling safety. Looking for Aluminium Containers for Insecticides ?